We are always excited to sign new customers for more than the typical business reasons. It’s an opportunity to meet new race directors, with new ideas about how they want to shape their participants’ experiences. While a niche race with interesting twists to the traditional road race may indeed create an exciting edge to a race, nothing will ever replace the need to market and advertise. Too often, a first-ever race never makes it to the third year. I advise clients to set an expectation to BREAK EVEN the first year. While a production organization can forgo some of the glitter of established races to keep costs down, they MUST create a solid marketing plan from the get-go. Ideally, a race should begin marketing itself twelve, but no less than six, months in advance of the event date in order to give it the upper-hand in making it to year two. After you’ve created the website, begin marketing immediately. 1) Get it on all of the local race calendars as soon as possible. Put it on the national calendars as well. 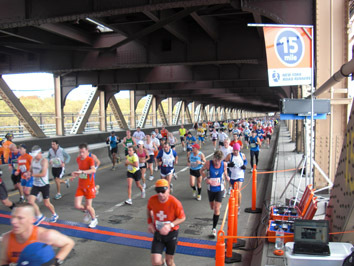 Runningintheusa.com, Active.com, and Runnersworld.com are some well-known national calendars. 2) Hire a professional to design and produce print advertising materials. This includes placards to place in running stores and small posters to hang in establishments that permit it. Do this as soon as the date and venue are established. Even if some of the details aren’t worked out, it’s fine. 3) Setup a social media marketing plan. Facebook pages are a must for any event. Seek established sports-related businesses in the area and negotiate cross-marketing plans that are win-win. A single mention of your event on a facebook page that has 5,000 page fans is a simple deal to make. 4) Don’t consider radio or television advertising unless it’s FREE. The costs of this type of advertising make this out-of-reach for most events just starting out. 5) Find the webpages that your market looks at to discover activities – even non-sports webpages. Sometimes, you can get a small banner ad for the price of a couple of registrations, per month. Be sure to mention anything that will draw the runner to your race. If you are using chip timing, for example, that can make your race stand out from the untimed fun run. Swag (the stuff runners get with their race entry) is also a big reason why runners return to events. It’s amazing how people like the free stuff they get in their packets! Most races just starting out will convince 75-150 participants to sign-up for their event, even with minimal marketing. Utilize the aforementioned tips, however, getting 200+ to your event is entirely possible. For most events that maintain reasonable budget controls, the difference in 100 people can often put them in the black. And for a first year event, that’s considered a big success. Race Timer & Chip Timing Dallas-Austin-Houston, Proudly powered by WordPress.